"You should've seen their faces," 32-year-old Pradip Siddi chortles, trying to hold back the paan juice that has stained his mouth a fiery red. Both he and his 40-year-old cousin and neighbour, Nagesh and their families, who reside in a remote settlement inside the dense tropical rainforests off Muski village in the Sirsi tehsil of Uttara Kannada (UK) district in Karnataka, have just told off political activists sent by local BJP MLA Vishweshwar Hegde of the Sirsi constituency. "They were offering to take us to Udupi and back for a May 2 rally by Prime Minister Narendra Modi. We declined just as we'd refused being taken for a Rahul Gandhi rally at Ankola, Karwar, by some Congress activists," he says as they work on sawing a large wooden pillar in half. Back from the last of several sorties carrying three pots of water from the mountain brook in the ravine below their house, Pradip's wife Mangala scoffs, "If we talk about water, power supply, perennial road access or healthcare, they ask us to wait for the next term. But during election season they remember us." She recounts an election rally that the whole family went for in 2013. "A truck went around picking us all up. We were given idli-chutney in the morning and driven through the treacherously winding Devimane Ghat to Kumta, 62km away. There, we were told that we'll get food after the rally. Around 4pm they gave us parcels of pulao. Maybe due to the heat or because it was packed a while ago, it had gone bad and inedible. My youngest Prajwal was only six. We somehow managed to buy a packet of biscuits for him. After we returned, all of us took ill. It meant no work and no money for nearly a week," she recalls, still bitter. Though Karnataka is home to most of the 50,000 odd Siddis in India, they are widely spread across UK (Yellapur, Haliyal, Ankola, Joida, Mundgod and Sirsi tehsils), Belgaum (Khanapur tehsil) and Dharwad (Kalaghatagi tehsil) districts. And yet in a tightly-fought election, where the stakes are high and every vote counts, politicians across parties are out to woo them. Kumta-based tribal anthropologist Dr Snehalata Shetty explains that all Siddis in Karnataka are descendants of seafarers from the Bantu people of the African Great Lakes region (Burundi, the Democratic Republic of the Congo, Kenya, Rwanda, Tanzania and Uganda), brought to India as slaves by the Dutch and Portuguese between the 16th and 19th century. One of the earliest references to the tribe can be found in correspondence traced back to a steamer that set sail from England to former Ceylon and onwards to the Western coast of India in 1832. This account describes a crew comprising seven English quartermasters, 43 lascars, six English engineers and 15 Siddimen or negroes as coal shifters. The tribe has, in the past, shunned contact with the outside world because of the intense racism they encounter for their African features – dark skin and curly hair. 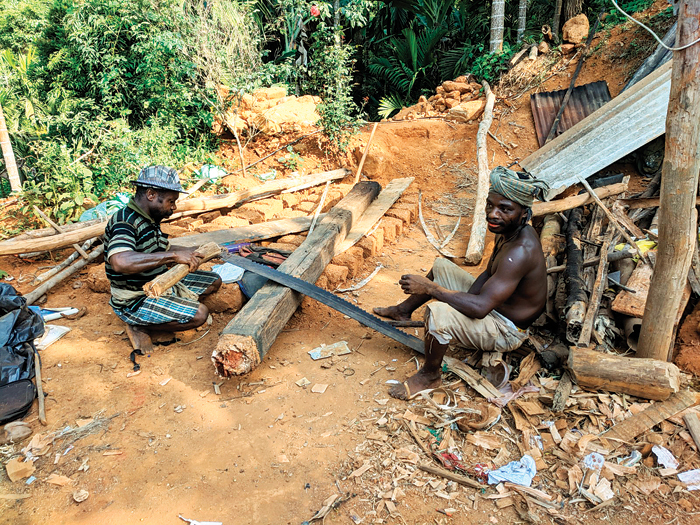 They are still targets of racist slurs by locals and largely limit themselves to selling forest produce like natural gum, honey, mushroom, bamboo shoots and lumber for sustenance, points out Uttara Kannada District Social Welfare Officer S Purshottam. "Apart from settling in remote locations, they had developed a collective defensiveness due to generations of being made to feel like outsiders. Earlier, they even reacted aggressively if outsiders approached them," he says adding, "Only in the last ten years have they begun to be open about sending their children to school and take baby steps to integrate themselves into mainstream society." Dr Shetty (who undertook a study on the Siddis in India two years ago) says there are several theories about how they crossed over from Goa to Karnataka's forests. "Some Siddi oral histories claim they helped Hindus flee Christian persecution during the Goan Inquisition and escaped themselves. Others claim they fled exploitative labour extracted with torture by the Portuguese." Though originally animists and worshippers of the feminine principle and their forefathers' spirits in Karnataka, the tribe is now either Muslim, Christian or Hindu. Ankola resident, community elder and spokesperson for Siddis in Karnataka, Yogendra Siddi says, "We needed patrons to sell the forest produce to and protect us. So we agreed to be part of the religion of whoever gave us work and food in return." According to him, this is why Siddis, who settled around areca nut plantations in Sirsi, Yellapura and Ankola, owned by Havyaka Brahmins, have become Hindus. "In Haliyal, they first became Muslims after the local lumbering community influenced them to convert. The Roman Catholic conversions only began in the 80s," he explains. In fact, in Mundgod tehsil – home to the large Doeguling Tibetan settlement (since 1966) – it is not uncommon to find Buddhist prayer beads, pictures of the Buddha and the Dalai Lama in Siddi homes. Despite these changes, the Siddis have held onto their Hiriyaru (elders who've passed on) worship, points out Yogendra. "We Siddis believe our Hiriyaru watch over us. We invoke them not only at marriages, births, naming ceremonies and deaths, but also during natural calamities or being cut off due to floods or a sickness or injury that doesn't heal." Hiriyaru worship, explains the Siddi elder, is what ties the community together irrespective of their adopted religion or region (Karnataka, Gujarat and Hyderabad in India or Makran and Karachi in Pakistan.) "It is this practice that makes it possible for us to easily marry inter-religiously." Proof of this is Mangala Siddi of Muski, who was Jabeeda in her maternal home in Amankope village, Haliyal. "The shaman communicated that the departed elders had blessed the union and I was married to Pradip," she smiles. Pradip offers a more rational explanation – he liked Jabeeda soon after he saw her, while she was on a timber unloading job in her village. Theories suggest that the first batch of Siddis arrived with Arab traders in 628AD at the Bharuch port, Gujarat, and few others claim they came here in 712AD as part of Muhammad bin Qasim's Arab army that laid siege to the Indian subcontinent. However, Dr Shetty insists these are only apocryphal. "Records show that the Portuguese sold off some Siddi slaves to the Nawab of Junagadh. The current settlements you see around the Gir forest are all descendants of that lot." Unlike the Siddis of Karnataka who speak Konkani, the ones in Gujarat speak Gujarati and have not only a strong Sufi tradition, but also worship both their ancestors and the feminine principle like their Karnataka counterparts. Coinciding with Navratri, the Siddis pray to the Goddess of Fertility, points out Dr Shetty. "In Gujarat, this amounts to their own version of a more animist version of Ambe Mata, while across the border in Makran and Karachi in what is now Pakistan's Balochistan region, they worship the Hinglaj Mata." She laments how this syncretism is under attack in today's polarised times. "Extremists are asking them to give up their own version of Sufi Islam for a more Wahabi version frowning on their age-old tradition and practices." Further south, off the Alibaug coast in Maharashtra's Janjira, is evidence of the Siddis reaching their epoch. Here, not only did they break away from slavery, but also went on to create a formidable naval armada, which could hold its own against the Mughals, Marathas, Portuguese and British, from the Goan border to Surat. "In fact, they established the kingdom of Sachin 10km from Surat that made them quite a force to reckon with. So much so that Aurangazeb drew up a treaty, promising them a sum of `400 per year to ensure protection for Mughal ships that travelled this route." Yogendra also points out how this martial race made a name for themselves in the employ of the Nizam of Hyderabaderabad, where they rose to become chieftains in the infantry and cavalry. "Some descendants, who reside in the walled city, are also some of its wealthiest," he exclaims and gives the example of the close confidante of Razia Sultana, the first female monarch of the Delhi Sultanate (1205-40). "Jamal ud-Din Yaqut, the Siddi slave-turned-nobleman, was also her lover, though this is often disputed. Most Indians, just like her own Turkish clansmen of that time, could not accept a Siddi man having a relationship with a reigning monarch of her order. " All talk of past grandeur must make little sense to Anuradha Nagesh Siddi of Muski village. She is worried that there is no food left in the anganwadi to feed the children. "Once the rains set in, they don't let up for days at a stretch in the Malenad (literally, 'land of the rain') region. The dirt track, our only connection to the outside world, then doubles as the path for jungle streams to come together as a muddy river. Walking across the slippery terrain can be dangerous," she says and adds, "I hope they send ration and rice supplies for us to tide over the monsoon, which will set in soon after the new government is sworn in." She hopes the Siddis are not forgotten as the fringe once again after elections are over. "It has repeatedly been brought to fore that the Siddis are not only very fit but also great at athletics. The Sports Authority of India runs a sports programme at Sambrani to nurture such talent," says S Purshottam, Uttara Kannada Social Welfare Officer. He cites names of Kamala Mingel Siddi, Rupal Siddi and Alex Siddi, who have got honours in athletics events such as running, 100m dash, javelin throw, shot put, etc. both nationally and internationally, to underline his point.